For my inaugural foray into interactive media mimicry, I thought I'd treat you guys to something a little special. I've been meaning to discuss this particular gem for quite some time as it is a guilty pleasure of mine. It also addresses the mystery of just who that strange blue lad in my avatar and blog header is. In the past, I've mentioned that I spent my early years in Japan where my father played baseball. As a Famicom child, it would follow that I played a game or two that never found its way to the West. Power Blazer was such a game. 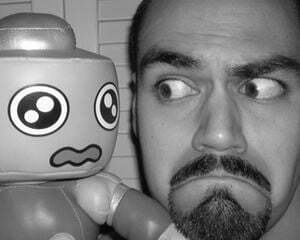 And heaven help me, it looked like Mega Man. If I at the tender age of five could tell that I was playing a crass knock-off, someone out there better be ready to throw down some yellow flags on this case of foul play. Though this title in its original form never left Japan, you may have heard of another game called Power Blade. 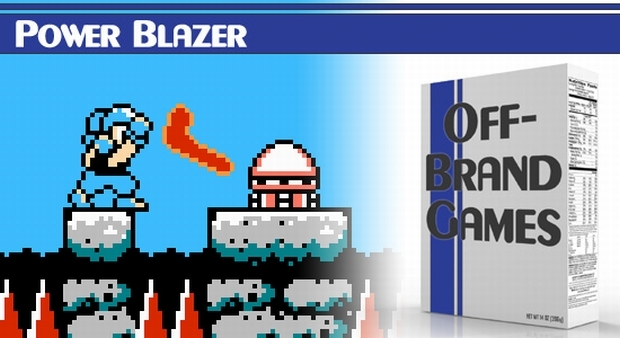 A Nintendo product evaluator saw some merit in Power Blazer but had quality concerns and thus reworked the game into something a little more palatable. The hero was replaced with Arnold Schwarzenegger's Chevrolet-inspired twin Nova, the game's mechanics were tweaked, and the linear levels of the original were scrapped for ones with multiple paths and tighter platforming. Except for the music and a few enemy sprites, the entire game was overhauled and the result was one the best rarely mentioned classics on the NES. Power Blazer is not that game. In the late 21st century, all the nations of Earth are managed by a central computer called the Brain Master, but one day it goes Skynet and causes machines the world over to freak out. You are Steve Treiber, a super soldier decked out in a blue bicycle helmet, a black wife beater and the only man able to stop the madness. Oh, and you use a boomerang. How many games assign a boomerang as your default weapon and not just as a sub item? Ty the Tasmanian Tiger and… uhhh? To be honest, it's an interesting tool with some clever implementation. At the outset, your boomerang has a very short range as indicated by your power meter. Collecting a certain item extends the meter and allows you to hurl the weapon farther, but each throw drains the meter and reduces the range of subsequent throws unless you allow it time to refill completely. The boomerang returns upon contact with an enemy, but by overshooting a baddie the boomerang can skip along its backside, scoring multiple hits. Aside from boomerang gimmick, game progression is straightforward. You select from one of six stages, all of which must be completed before you can gain access to the final level. 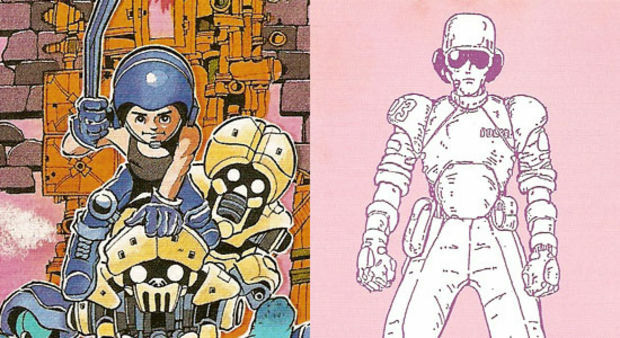 You square off against a gamut of themed robo-nasties in locales such as a military base, a weather station, and an abandoned residential zone. Quite by-the-numbers. 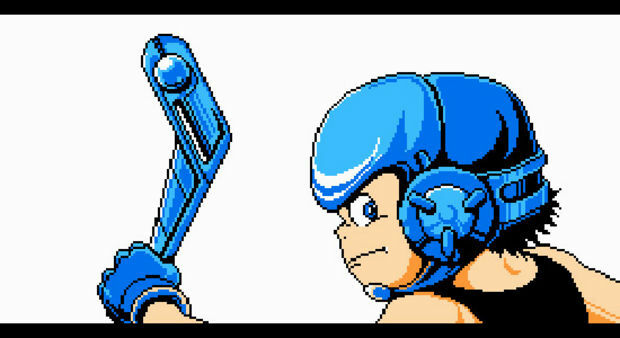 If guiding a short, blue wonder boy around a stage select screen with the goal of wrecking a mechanical master at the end of each world sends waves of déjà vu down your spine, the levels themselves won't do anything to erase that sensation. 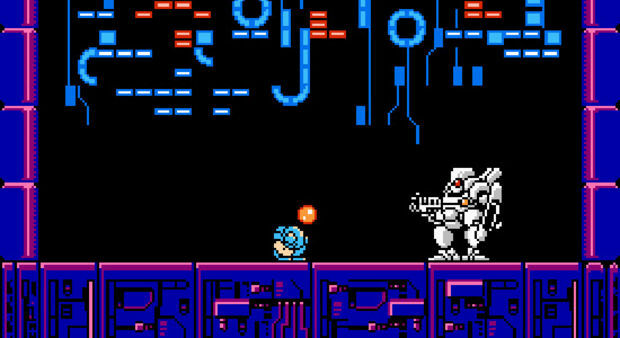 Every obstacle seems to have an analogue in the Mega Man universe. Large robotic frogs, gargantuan-yet-immobile pellet launchers, and little hard-hatted critters that expose themselves for only a moment to fire a shot or two. 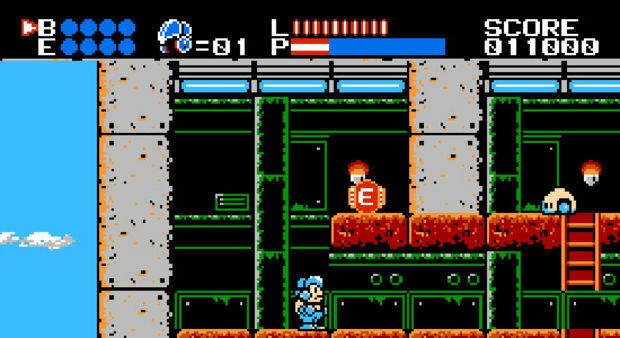 Hell, even the damn vanishing blocks that are the bane of every long-time Blue Bomber fan make an appearance. This wouldn't be too much of an issue if the game at least played like Mega Man, but Steve plods at a pace somewhere between Simon Belmont and a Slinky and gets about as much air as a forklift. Those skills are invaluable when it comes to hopping from falling platform to falling platform or across foot-wide gaps to ledges that are a block higher than your current elevation. But the best parts are the long stretches of nothing save for a gaggle of migraine-inducing jokers who track your relentlessly. After all that, the bosses don't even have the courtesy to offer you a weapon upon their defeat. 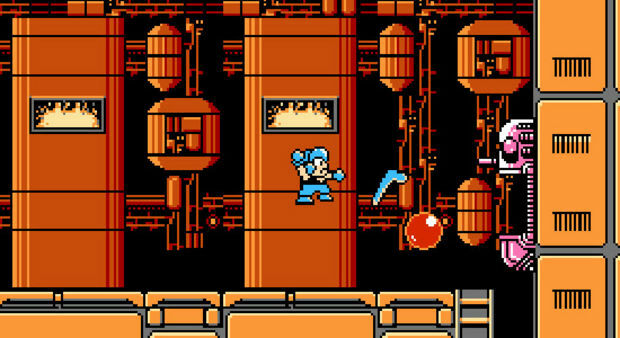 So if you were to follow the flowchart of this game's design, you'd begin with a typical Mega Man game, replace the gun with a limited-range weapon, eliminate all athletic prowess of the protagonist while keeping the enemies just as capable as ever, then alternate level terrain between barren and frustratingly ridiculous. Not to worry, though. Should the game prove too much to handle, you are allowed to store up to four E canisters that refill your health instantly. Golly, where ever did they come up with that? Yet as mediocre (and short) the entire experience is it remains one of my favorite games of all time. A large part of that love is thanks to the thick lenses on my nostalgia glasses. Another part is that Mega Man is my favorite game franchise of all time, and so great is my appreciation of it that the love extends to the weeds that sprout in its footsteps. But most of all, I love the music. If nothing else, Power Blazer features some catchy tunes composed by the same chick who did the music for the original Castlevania. Also, one of the robot guardians is named "Brian D. Danger." Does the "D" stand for "Danger" as well? "Brian Danger Danger"? "Danger's not just my middle name but my last name as well!" Did Goichi Suda work on this game? Years ago, I gave this game along with the rest of my Famicom collection to my uncle's family for them to do Lord-knows-what. It left a burning desire in my heart that intensified whereupon I snatched up a complete-in-box copy off of eBay some months ago on a whim. With the game back in my possession, I came to the realization that Steve Treiber is the greatest gaming icon in the history of forever. Think about it. Against the deadliest metal nightmares mankind has wrought, he shows up to the party with a boomerang. A boomerang! It takes some serious cojones to thrust yourself into the thick of battle with something that can be purchased at your local dollar store, but if Jason Bourne can beat a man senseless with a rolled-up newspaper then Steve Treiber can chuck a goddamn boomerang. Even his name is brilliant! "Mega Man," "Nova," those are not names but handles that denote excellence in their profession. "Steve," on the other hand, is just an Average-Joe name. "Steve" is your buddy! "Steve" will buy you drinks at the tavern! He certainly doesn't look the part of a super soldier. His profile in the game manual makes him appear lean, tall, and equipped with the latest survival gear. It's in stark contrast to his box cover and in-game appearance which pegs him as a short man with a beer gut and lax standards of dress. Steve Treiber represents the everyman, lacking athleticism yet applying just enough effort to get the job done. He is my hero. And he uses a boomerang. And I will fight you all to the death if you do not agree with me. So... yeah. Power Blazer. 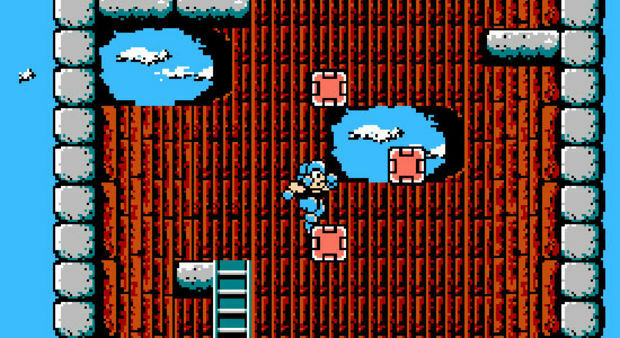 It's Mega Man with the lazy All-American can-do spirit. And a boomerang. Maybe that floats your boat. It definitely floats mine.